Just Jingle: Love You More!!! So, the other day I got a bunch of AWESOME goodies in the mail from My Mind's Eye and I couldn't WAIT to dive into them! 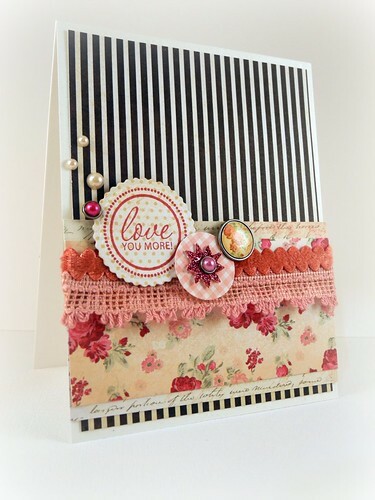 Then, just yesterday, I saw that Paige over at the Create Blog is challenging us to create vintage floral inspired cards. 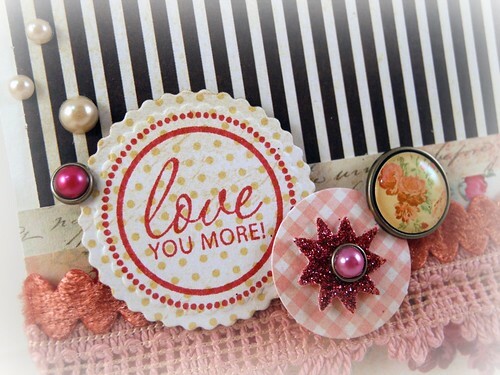 So, with that, I decided to use some of the fun goodies to create a Love You More card! I used the Family Dynamix set from Unity for this one along with a May Arts velvet ric rac and a few pearls from Creative Imaginations. Everything else is My Mind's Eye! I, my dear friends, am SO excited that today is Friday! We are going to see Recycled Percussion tonight, and that should be way fun and then we have the weekend to ourselves! YAY!!! I hope you have a fabulous weekend planned! P.S. I'm out of Jelly Beans. That's a little sad, but I'm working through it. Love all those layers of paper and texture... yum! Just beautiful! I LOVE the black stripes against the pastels. Love the contrast of the bold stripes with the girlie floral. excellent. Oh wow. This card is STUNNING! So beautiful! Have fun tonight and sorry to hear you are out of jelly beans...hope you get through it ok! What a pretty card!! Love the mix of patterned papers and trims. Love it! Oh, honey, I'm so sorry about your jelly bean situation--uh, we were at Sam's Club, the big Wal-Mart warehouse store, and there were GIANT bags of "designer" jellybeans, and I thought, if J lived closer, I'd drop these at her doorstep. Lovin' this card! Have a fun weekend!!! gorgeous card...sad about the jbs. This is so sweet, it makes me want to whip up an old fashioned ice cream soda in a big tall glass! Love those gorgeous trims, and the fun sparkly accent, and that PAPER is drool-worthy! Love the design of your card...very pretty! FABULOUS! - LOVE your card! Beautiful card! Love the contrast of the soft pretty floral with the B&W stripes. Awww...a girl who's out of jelly beans is not a happy camper:( I could send you a big bag of...red ones, right? Cause they're all good!! Love your card, all the gorgeous new goodies on it. Beautiful! I really like the colours your chose, and I like the way the pearls seem to float. 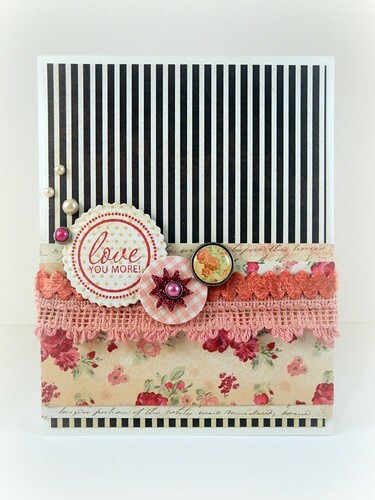 Love this card-such fun goodies you used. Thanks so much for your visit, always love new visitors. Great use of colours and textures! This is just beautiful. I love the floral brad that is on the lace and near the sentiment. BEAUTIFUL! LOVE the layout - and all those yummy colors! Super gorgeous! I love the layers of trim and the pretty colors. This is so pretty! Love the combination of colours and patterns! Hope you were able to get some jelly beans! Love the combination of stripes and florals. Lovely card! ohhhhh I loveeee this!!! !the papers are sooo beautiful!! yep, GORJE. love the victorian garden feel to it. very inspiring!